Chennai : JFW, South India’s community for women (a fore-runner in both the offline and digital space), is all set to host the 10th edition of its Awards for women achievers on Saturday, September 15th, 2018, at Sir Mutha Venkata Subbarao Hall in Chennai. The year’s most awaited Awards ceremony is one night of glitz and inspiration with film personalities and stalwarts of various fields gracing the stage. The list of Awardees include Poorna Malavath (Youngest girl to climb Mt.Everest), TK Anuradha (ISRO scientist), Kausalya Sankar (Dalit Activist), Manju Warrier (Actress & Activist), Bombay Jayshri Ramnath (Carnatic & Playback singer), Aruna Reddy (Gymnast), Keerthy Suresh (Multi-lingual Actress), and Sudha Ramalingam (Lawyer & Activist). The awardees will be presented by peers from the film industry and the business world. JFW Awards celebrates the winning spirit of women from various fields. JFW hosted its first awards in 2008 as an ode to every woman, to extol her simplicity, steadfastness and her ability to multitask and make a change. Established in 2007, JFW true to its tagline – Stylish, Spirited, Smart is the grandest platform to celebrate the success of women. “It is a matter of immense pride for us as we complete a milestone with this 10th Edition of our JFW Awards. We had initiated this one-of a kind award ceremony a decade ago as a way to recognize and appreciate the success of South Indian Women who have made a mark in their chosen fields. With stellar names as awardees year on year, our JFW awards have been an inspiration for many young women to pursue their goals and dreams and reach the heights of success. What makes the JFW Awards unique is that it is the grandest platform to celebrates women from such diverse fields”, says Bina Sujit, Editor-in-Chief, JFW magazine. The event will also witness power-packed dance performances by Bigg Boss Fame, Bindu Madhavi, Lakshmi film fame, Ditya, and a musical rendition by singers NSK Ramya and Devan. The event will be telecast on Star Vijay on a later date. 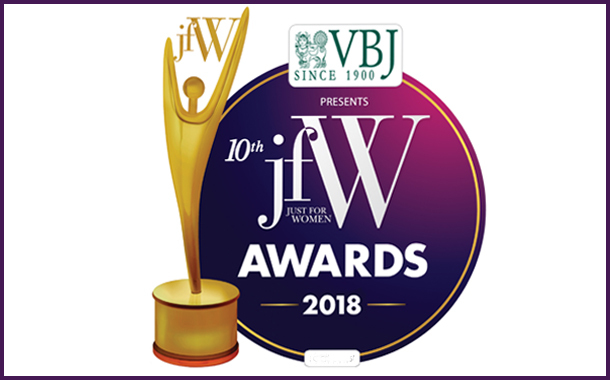 The 10th edition of JFW Awards will be held on Saturday, September 15th, 2018, at 7PM at Sir Mutha Venkata Subbarao Hall in Chennai and will witness inspiring stories of empowered women.